Venison goes very well with sweeter ingredients like dried fruit and port. Instead of trying to choose between the two, I like to just add both. This creates a truly legendary dish with a cut of meat that can otherwise be difficult to cook and which can easily end up dry. 1. Mix the coriander, rosemary, cloves, cinnamon stick, bay leaves, port and garlic in a bowl. 2. Now let the meat and marinade join forces either in a large marinating bowl (plastic, glass or ceramic) or a plastic bag. Cover the bowl or seal the bag and let it marinate in a fridge for 2 days. Turn the meat roughly every 8–12 hours. 1. Take the meat out of the fridge an hour before you start cooking. 3 minutes a side to give it a nice colour (don’t throw the marinade away; keep it for later). Take the meat off the fire and keep it out the way of hyenas, dogs, etc. 3. Over a hot fire, heat the oil in the potjie and fry the onions and bacon for a few minutes until the onions are soft and start to brown. 4. Put the browned meat inside the potjie, and then add all the marinade left in your marinating bowl or bag. Heat up till the sauce starts simmering, then cover with the lid and cook over a low fire for 2 hours. It should just be a slow simmer. 5. If prunes are one of the dried fruits you want to add, now is the time to pit them if they don’t come that way in the packet. Otherwise it’s a broken tooth waiting to happen and that’s no fun when you’re camping in the bush. 6. After 2 hours of simmering, add the carrots, dried fruit, lemon juice, salt and pepper, and then simmer for a further 1 hour (covered). Keep the temperature low and steady. Add a bit of water only if the pot looks too dry. 7. By now the meat should be really tender. Lift the meat out of the pot onto a wooden carving board and slice into thick chunks – it should just about fall apart by itself. 8. Put the meat chunks back in the pot and stir them carefully into the sauce. Add more salt if necessary. Serve with mashed potatoes. It will be great – end of story. If you want more sauce in your pot after carving the meat into chunks (before adding the meat back into the pot), just add a cup of beef stock to the sauce in the pot and bring it to the boil. Boil for about 2 minutes, then thicken slightly with some dissolved cornflour if necessary (mix half a tot each of cornflour and water, see instructions at the bottm of page 124). Stir and bring to a simmer, then add the meat to the sauce and serve. Bobotie is a South African classic and an important part of our culinary heritage. It’s also one of my favourite meals, but this doesn’t make me special: everybody loves bobotie. As with many other South African cult hits, you can cook it very successfully in a potjie on a braai fire. I believe it’s your moral duty to perfect the art of making bobotie. It’s a great way to show off when you cook for visitors to South Africa. Heat the oil in a flat-bottomed potjie over a medium-hot fire and fry the onions and garlic until the onions are soft but not brown. Add the curry powder and turmeric, then fry for a minute – the bottom of the potjie will look quite dry, but don’t let the mixture burn. Chuck in the mince and fry for about 10 minutes, stirring it to break up any lumps with a wooden spoon. The mince should change colour from red to light brown, but shouldn’t turn dark yet. The meat should release some juices – use these juices and your wooden spoon to loosen any sticky bits on the bottom of the potjie. Add the salt and pepper, apricot jam, raisins, almond flakes and vinegar/lemon juice. Stir well, bring to a slow simmer and put on the lid. Simmer for about 15 minutes, stirring once in a while to make sure the mixture doesn’t burn. Now remove the lid and flatten the mixture with the back of your spoon so that it’s even across the bottom of the potjie. Whisk the eggs and milk together in a small mixing bowl, then pour over the bobotie. Stick the bay leaves into the egg mixture. Cover with the lid and put a layer of hot coals on top of the lid. At this stage you only want coals on the lid, not underneath the potjie. Cook for 30 minutes and the bobotie should be ready. Serve with rice and chutney on the side. You might like to serve sliced banana, coconut or chopped tomatoes with the bobotie. Whilst visiting the Inyati rest camp in the Sabi Sands game reserve I prepared the recipe below on the braai. On that particular occasion the biltong and cream sauce was served with braaied Springbok fillet steaks, but you can just as successfully serve this sauce with normal beef steak. As I don’t have a particularly nice photo of the finished meal, I decided to rather post a picture of the lion cubs we saw later that day after having our meal of braaied Springbok steaks with biltong and cream sauce. 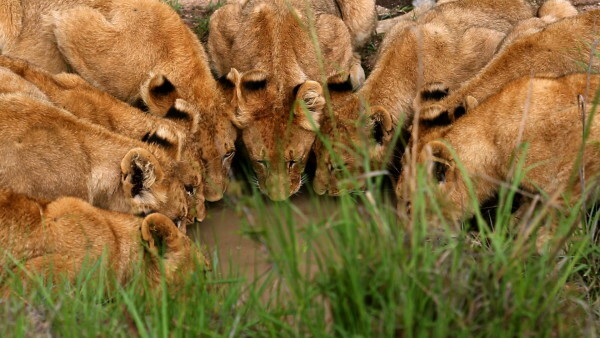 The lions had Impala on the menu that day if I remember correctly, but again, posting a pic of their food is probably not family friendly either so here a pic of them having their after dinner drink. Sauté the onion in the butter and oil for about 4 minutes. Add the biltong to the pan and let it sweat for a minute or 2. Add the salt & pepper and half of the cream and stir through. Sprinkle the beef stock over the contents of the pan and stir through. Add the rest of the cream, stir and let simmer whilst you braai the steaks until you are happy with the consistency of the sauce. Braai the steaks until medium rare and serve the sauce on the steak. Jeremy Freemantle and the African Relish Team hosted us in the previous episode of Jan Braai for Erfenis and has graciously sent us these recipes to share with you. Make a mixture of Maldon sea salt, crushed coriander seeds and freshly crushed black pepper and rub this all over the venison fillet. Braai the fillet until lightly brown on all sides, being careful not to braai the meat too much, it should be sealed outside and raw inside. This should take no more than 3 minutes in total. Set aside to cool. Mix together the soy sauce, honey, garlic, balsamic vinegar and 1 tablespoon extra virgin olive oil. Set aside. Whisk well together. Combine the Dijon mustard, lemon juice, egg yolk, 3 tablespoons olive oil and 1 tablespoon water. Using a hand blender, aerate this mixture until it forms a light froth on top. Set aside. Using a very sharp knife, cut the cooled venison into thin slices and arrange on a serving platter. Drizzle with the Tataki sauce . Froth the mustard emulsion dressing once more and sprinkle the foamed emulsion over the sliced springbok. Garnish with mixed baby herbs and edible flowers.